Simply put, the code rate can be defined as the ratio of the data rate that is allocated for a subframe and the maximum data rate that ideally can be allocated in the subframe. In other words, it means "The code rate is defined as the ratio between the transport block size and the total number of physical layer bits per subframe that are available for transmission of that transport block". A lower code rate means that more redundency bits are inserted during the channel coding process and a higher code rate means that less redundency bits are insterted. Is there any theoretical limit for Code Rate ? Exact Calculation of Code Rate would be a little tricky and explaining the calculation method in writing may be even more tricky. If you are the type of person (like me) who can grasp the meaning from visualized from, refer to following illustration first and then try to read the rest of this page. I think this question would imply "Is there any theoretical Max Code Rate that would achive max throughput with minimum BER (or zero BER : Bit Error Rate) ?". The relation between Code Rate and BER is a kind of statistical (probablistic) relation.. it is hard to find a clear cut value for this answer. When it comes to reality, the situation gets even more blurry since the performance of the reciever comes into play as well. However, there is a guideline in 3GPP specification. TS36.213 7.1.7 Modulation order and transport block size determination and it says as follows. The UE may skip decoding a transport block in an initial transmission if the effective channel code rate is higher than 0.930, where the effective channel code rate is defined as the number of downlink information bits (including CRC bits)divided by the number of physical channel bits on PDSCH. If the UE skips decoding, the physical layer indicates tohigher layer that the transport blockis not successfully decoded. For the special subframe configurations 0 and 5 withnormal CP or configurations 0 and 4 with extended CP, shown in table 4.2-1 of TS 36.211: “Evolved Universal Terrestrial Radio Access (E-UTRA); Physical channels andmodulation”, there shall be no PDSCH transmissionin DwPTS of the special subframe. Based on this, I did some experiement with one of my reference device and eNB simulator. The test condition and the result is as follows. As you may guess, I got the best throughput with no CRC error with CFI = 1. I got pretty good throughput at CFI = 2 as well but I start see small portions of CRC error. If you don't decrease MCS at the subframe with PBCH, you would get much higher CRC error. We can say this result is pretty well aligned with the guideline described in 3GPP. With CFI = 3, my reference device still tries to decode PDSCH even though Code Rate is very high (Based on my experience, all the Devices try to decode anyway however high code rate it is), but too high CRC error that leads to call drop. Let's take an example with MCS = 8 and No of RBs = 3. For this we have to get the two numbers based on specification quoted above. (i) refers to "(Transport Block Size + CRC bits)" which is the size of the message that gets channel coded. (ii) refers to the number of available bits in the PHYSICAL LAYER. Each resource element(RE) can carry 2, 4, or 6 bits depending on the modulation scheme.We just have to count the number of REs reserved for PDSCH transmission on each subframe, and then multiply it by 2, 4, or 6 (accordint to modulation scheme) and then we will have the number of physical channel bits on PDSCH. b) (14 symbols/subframe) x (3 x 12 REs/symbols) = 504 REs/subframe. Out of this 504 REs, we have to remove those REs allocated for PDCCH since it is not carrying the real data. Let's assume that 3 symbols/subframe are allocated for PDCCH. In this case, the number of REs for avaiable in PHY LAYER for data transmission is 504 - (3 x (3 x 12)) which is 396. Now we have to convert this number into "number of bits". In our sample case, the modulation scheme is QPSK which carries 2 bits per RE. Therefore, the value for item (ii) is 2 x 396 = 792. This assumes that the subframe does not carry PBCH, PSS, SSS. If it is the subframe that carries these signals, we have to remove the REs for PBCH, PSS, SSS as well. Now we have the value (i) and (ii). If you take (i)/(ii), you will get the Code Rate. Still now clear ? Don't worry, you are not the only one who get confused. I am also one of them. I just found a useful source clips from LTE Protcol Conformance TTCN (MAC_717.ttcn). For many engineers, one source code would worth 1000 words. 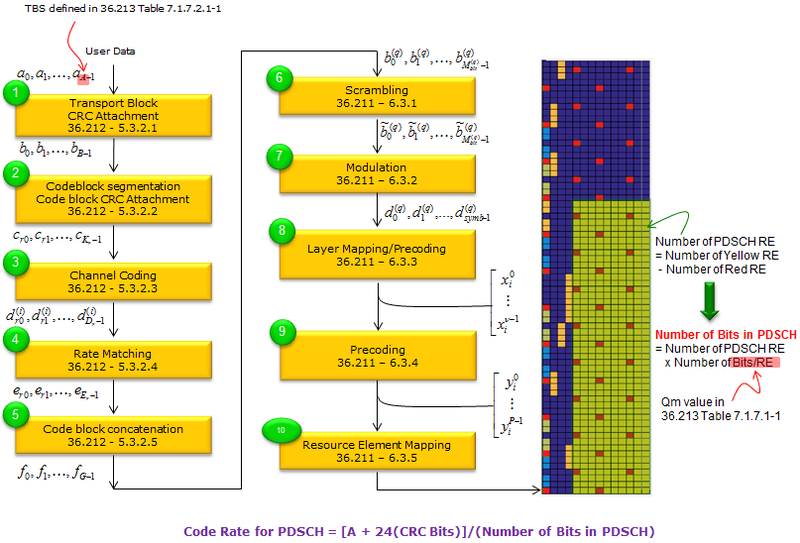 ii) How many symbols are allocated for control channel (PCFICH value) for Downlink ? iv) Does it carry SRS (Uplink) ? For more practical examples, refer to Reiver He's LTE Note : LTE FDD DL code rate calculation. You would see every detailed factors you need to consider if you want to calculate Code rate by hand. Followings are the code rate for each MCS in LTE assuming that the System Bandwidth is 20 Mhz and 100 RBs are allocated and 256 QAM is not supported. The exact code rate value would change a little bit, but the variation would be roughly within 1%. Following plot shows the relation between MCS and Code Rate based on the table show above.